Subaru is an automaker that thinks differently than the crowd and they want families to think out-of-the-box with the new 2019 Ascent 3-Row. They know what their niche market is and they don’t deviate from it. The brand is about building all-wheel-drive vehicles with a “go-anywhere” attitude and they want families to use their cars for adventure. It’s more than just a marketing theme, it’s a lifestyle choice for the Japanese automaker. Subaru of America just launched a new outdoor adventure event series with Kids Obstacle Challenge, the largest touring adventure and obstacle course event series for kids in the nation. Subaru is doing it to “encourage kids and their families to break out of their comfort zones,” said Scott Thompson, Regional Marketing Manager, Western Region, Subaru of America. Kids get to run through an obstacle course race with challenging obstacles and mud and their parents can run with them. The race is 1.5-2 miles long with 13-15 obstacles like a cargo net climb, ball pit, mudslide scramble, mud crawl, clif climb and rope swing for kids ages 5-16. 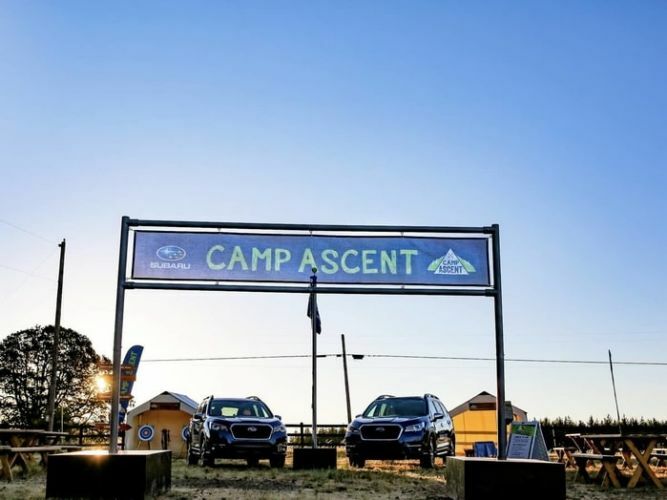 Subaru brings “Camp Ascent” so families can see and touch the largest vehicle the brand has ever built. Subaru encourages families to think out-of-box and take their Subaru all-wheel-drive vehicle off-road and get away from civilization. It’s what the Japanese automaker is all about, fun and adventure. Subaru says they are all about the “love of adventure and commitment to making outdoor fun as accessible as possible.” Subaru built the Ascent with a “go-anywhere” attitude and it comes equipped with X-Mode for those serious off-roaders, and 8.7 inches of ground clearance. It’s paired with Hill Descent Control that helps maintain a constant speed when traveling downhill enhancing vehicle control on a backcountry trail. Subaru Corp built the largest vehicle they’ve ever produced and infused the new 2019 Subaru Ascent with a recreation-purposed “go-anywhere” attitude that made the brand successful from the beginning. It’s not just a trendy marketing theme, they encourage families to think out-of-the-box.